One of the best places for cross-country skiing in Alberta, the Canmore Nordic Centre Provincial Park is located just outside of Canmore. Situated at the foot of Mount Rundle in the Canadian Rockies, this park provides trails for cross-country skiing, mountain biking, and hiking. This park was originally constructed for the 1988 Winter Olympics. 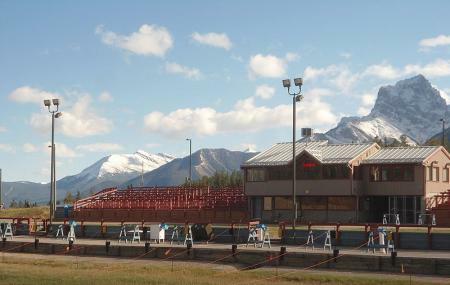 How popular is Canmore Nordic Centre? People normally club together Quarry Lake Park and Elk Run Blvd while planning their visit to Canmore Nordic Centre. one of the best cross country skiing centers in Alberta and has great facilities. if you are near by, its good to pay a visit in weekend. you can rent equipment at very reasonable price and also chill out after your exercise in the very cafe located within the area. they have good snacks, good coffee & beers. staff are very friendly and kind. I truly love living so close to the mountains, Canmore is everything is chalked up to be. Went Cross country skiing with a very good friend and it was fabulous, even for a beginner. Great price and really.. Who doesn't want to breathe in all that fresh air and gaze at the mountain surroundings while getting a workout! This place is amazing, you can use the trail for free. The place is perfect to practice, exercise or just having fun and then sit down, relax and enjoy a good coffee! There is also a small exhibition of the 1988 Olympic games. World class facility, great for learning Biathlon & such skills. Professional managed.